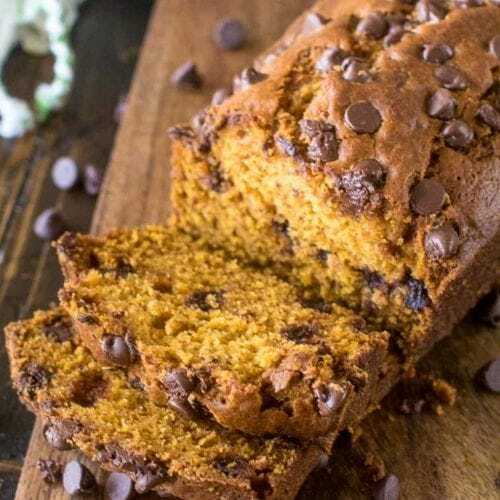 Tender, delicious homemade pumpkin bread stuffed with sweet chocolate chips! 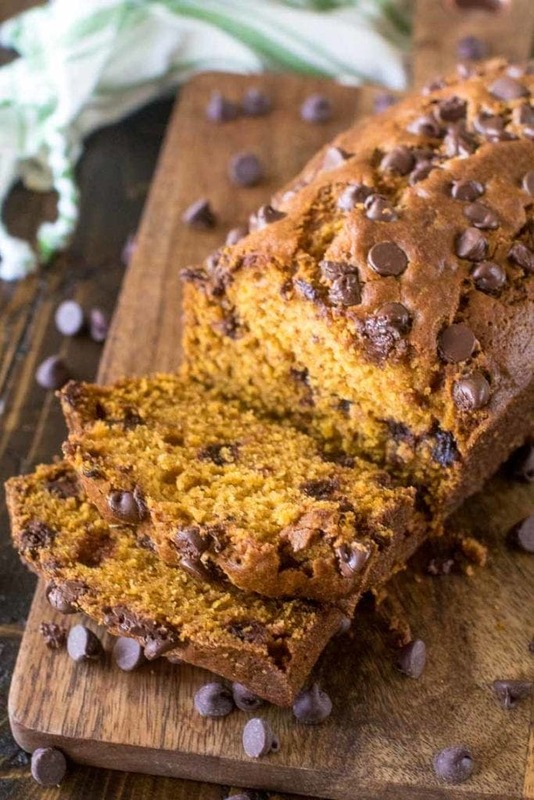 This Pumpkin Chocolate Chip Bread is the perfect fall snack for your sweet tooth. I love grabbing a big warm slice, loading it with butter and enjoying it with my coffee in the morning or as an afternoon snack! Grab the ingredients and make this quick bread today! I love all things about fall. Yes, the days are getting shorter but it’s so wonderful to feel the cool fresh air and breath it in so deeply. The leaves are just about gone, but fall is such a beautiful time of the year! Halloween is past and can you believe Thanksgiving just a little over a week away! Isn’t that crazy?!! I decided I’m not going to wish the season away though. The kids and I have been kicking up leaves and playing outside while we still can! 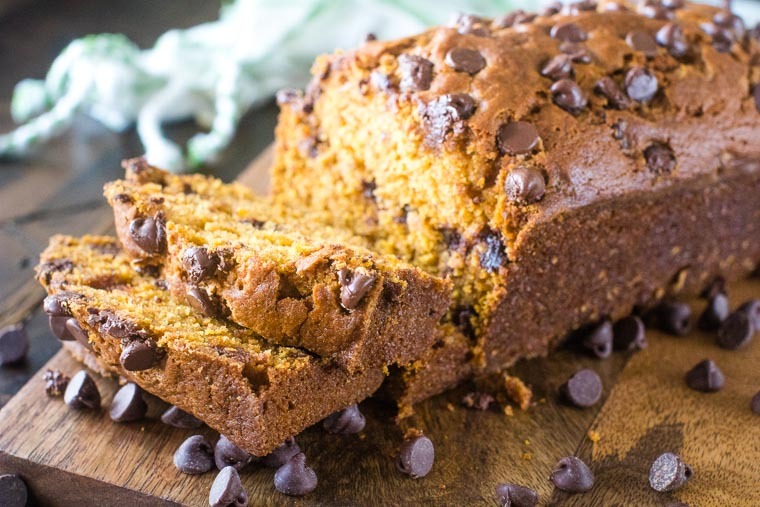 Another way to stretch out fall is by enjoying a big slice of Pumpkin Chocolate Chip Bread. Savoring it with a great cup of coffee while sitting by the window or out on the porch just enjoying a beautiful fall day, wouldn’t you agree? I know we all have tried pumpkin pie, but have you ever tried pumpkin bread with chocolate chips? Sweet pumpkin pairs deliciously with chocolate chips (I like using dark chocolate chips.) and bakes up beautiful in this sweet treat! 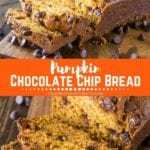 My Chocolate Chip Pumpkin Bread Recipe is easy to make! When you bake this loaf your whole house will be filled with a delicious aroma of great fall spices. Seriously all you need to make life complete is THIS bread and a big slab of butter and a cup of coffee! 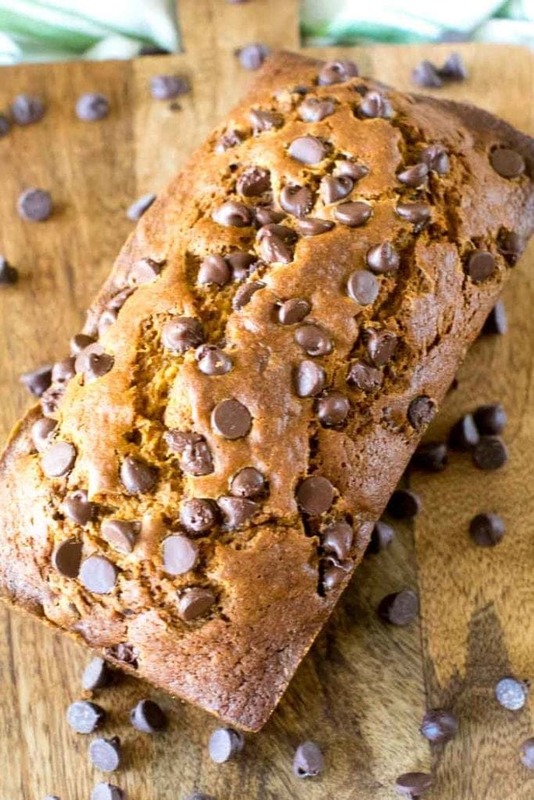 And if you do decide to use dark chocolate chips, I will stand beside you and argue that this pumpkin bread with chocolate chips can be sliced up for breakfast! I mean pumpkin is great for you and just think of all those antioxidants in dark chocolate! I’m a great friend, supportive like that ya know?!!! Prepare two 5x9x3 inch loaf pans by coating with non-stick spray. Combine the pumpkin, oil, eggs and water. Add dry ingredients. Mix until combined. Cool for 10 minutes and remove from pan to wire rack. If you’re looking for a tasty treat when during the holidays, be sure to bake up this bread! It’s perfect for company or an easy snack while you’re waiting for dinner! More delicious pumpkin recipes perfect for fall! What’s on the menu for Thanksgiving? Do you have it all planned out yet? I hope you add this recipe to your menu! Be sure and leave me a five-star comment below! Bake it up for the holidays and be sure to snap a photo and tag me on Instagram at @julieseatsandtreats or #julieseatsandtreats – I want to see pictures of all of your holiday eats! Preheat oven to 350 degrees. Prepare two 5x9x3 inch loaf pans with non-stick spray, set aside. Bake for 60-65 minutes or until a toothpick inserted near the center comes out clean. Looks yummy I’m going to cut down the sugar almost half! 3 cups sugar and 1cup chocolate chips is a lot! But I have a can of pumpkin calling my name! Thanks for the idea! This is picture perfect! 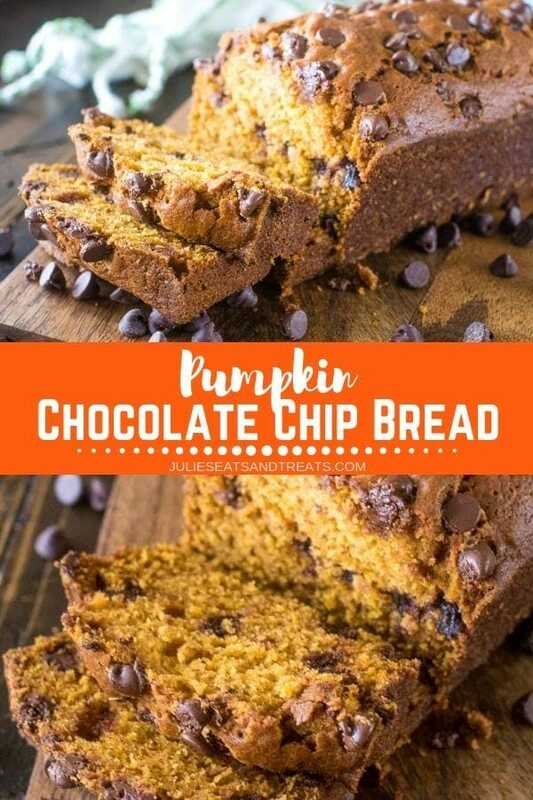 I love the combination of pumpkin and chocolate chips! Such an amazing flavor combo! I could eat this stuff all day long! And I love how it makes my house smell! I can eat an entire loaf myself!! Pumpkin bread is literally the BEST bread. It’s even better with chocolate chips in it! You can never go wrong adding chocolate chips to anything! Thank you for this recipe, Love it! !